NEILLSVILLE, Wis. — February 1, 2018 — Associated Bank branches across the footprint are donating to their local American Legion Post to show support for veterans. Check presentations are taking place with corresponding American Legion Post chapters in January and February. 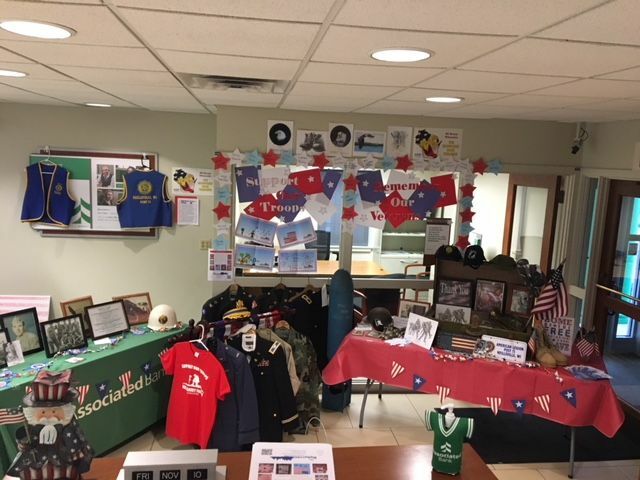 The Neillsville branch display consisted of uniforms, boots, honorable awards and badges and a practice bomb from the local American Legion Post. They were also honored to host a military vehicle in their parking lot for a day, courtesy of the Armory and Highground Memorial. This was the fifth year Associated Bank held this event. Associated Bank is committed to supporting veterans and military personnel within our business as well as our communities. View more about our veteran and military benefits at http://careers.associatedbank.com/veteransandinstructions.aspx.